Frederick did not quite understand what I said. I was using a very historic and too long name. I said: “Let’s call the green one Frederick and the red one Sheila like your little sister “. We named them in Gamesontrack and assigned new names for the two trains. I had already assigned names to the two sounds on my decoder for the green train: “machine, and whistle” . Ready to go: “Frederick forward four five” and “Sheila forward two seven”. Things were moving nicely when the green train passed Frederick I said. “Frederick machine on” , just to demonstrate the capability. Frederick did not understand it. It sounded much more like when his uncle John is crashing old cars with the big grab, he said. We then decided on a new name for the sound call “Caterpillar” so the command statement became “Frederic caterpillar on”. We spent the rest of the afternoon driving trains and sounds using special names. Far away from my normal model railway interests, but I had a splendid time together with my youngest grandson. We create the software behind your possibilities. We connect your layout with a virtual world and we help you to control better, to run with high intensity and to play exciting games on your layout. Our products can be applied for any mark you use, if only you have a digital controller with a PC interface. Over the next 6 to 12 months we will open an entirely new world for you and your model railway. Keep yourself informed so that you can contribute to the new trend, where the virtual and the physical world meet in new and exciting possibilities. 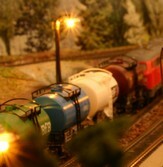 Model railways become as in as never before for children, teenagers and adults.